Quite a clever haiku. The fact that the crafter is 8 fills me with joy. My name is Mason and I am 8 years old. I go to Beach Elementary on Lummi Island and this is my first published poem. I came up with the poem, Hologram, by flipping through a dictionary and randomly picking a page. I decided the word I chose would be the title of my poem. 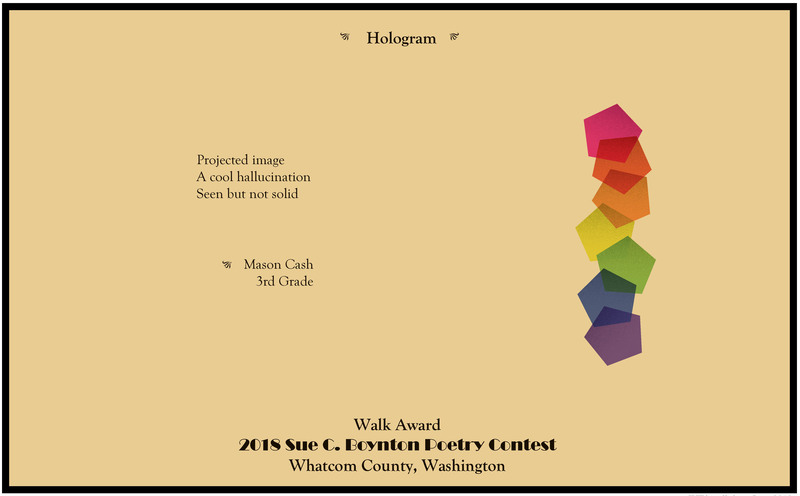 I then thought of the characteristics of a hologram and used those to write my haiku. *Copyright 2018 by Mason Cash. Broadside illustrated by Megan Carroll.